Although you employ the Organization Chart Wizard in following exercises, it is useful to understand initially at which easy point it is to create diagrams of org to the hand. In this exercise, you’ll create a new org chart by dragging shapes onto the page and using the org chart template’s auto-positioning features. You’ll also enter data for each shape in the chart. Drag the Executive shape from the Belt – Organization Chart Shapes stencil to the top center of the drawing page. 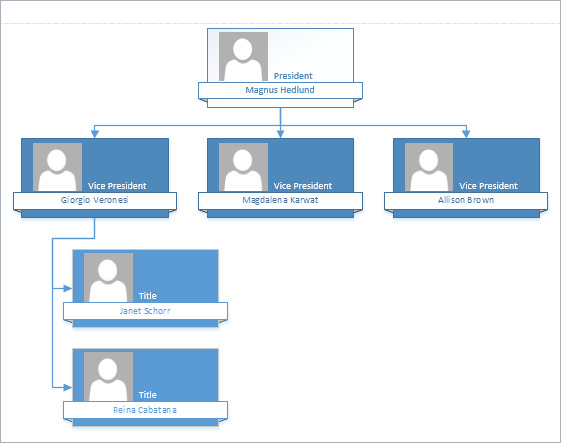 The title of the Organization Chart Shapes stencil in Visio 2013 is preceded by the name of the currently selected org chart style. When you start a new drawing, it defaults to the Belt style; consequently, Belt – Organization Chart Shapes is displayed in the title bar. With the shape still selected, type President, click the word Name, and then type Magnus Hedlund. Just as the title of the Organization Chart Shapes stencil includes the name of the currently selected org chart style, certain master names in the stencil also include the style name. For example, if you are using the Belt style, the masters include Executive Belt, Manager Belt, and others with similar names. Drag a Manager shape onto the Magnus Hedlund shape. Then type Vice President, click the word Name, and then type Magdalena Karwat. Notice that the org chart software automatically positions the new shape below the Hedlund shape. Repeat step 3 and notice that the org chart add-in has positioned the second manager shape to the side of the first one. With the new shape still selected, type Vice President, click the word Name, and then type Allison Brown. Drag one more Manager shape onto the Hedlund shape. Type Vice President, click the word Name, and then type Giorgio Veronesi. Drag a Position shape onto the Giorgio Veronesi shape, open the Shape Data window, and then type Janet Schorr into the Name field. Drag a Position shape onto the Giorgio Veronesi shape, and type Reina Cabatana into the Name field in the Shape Data window. Drag the Three positions shape onto the Magdalena Karwat shape, and use the Shape Data window to enter the following names from top to bottom: Filip Rehorik, April Reagan, and Scott Rockfeld. The Three Positions shape makes it very easy to add three people to the chart at once. Note that there is also a stencil shape called Multiple Shapes. When you drop it onto an existing org chart shape, it prompts you to select a shape type and to specify how many of them you’d like to add to the chart. Drag a Consultant shape onto the Allison Brown shape and enter Sandeep Kaliyath. Notice that the Belt org chart style does not provide any visual differentiation between Consultant and Position shapes. However, the appearance of the Consultant shape is different in other styles as you’ll discover later in this exercise. Drag a Vacancy shape onto the Allison Brown shape and type Open as the name. Notice that vacancy shapes do not include a photo placeholder. Drag an Assistant shape onto the Magnus Hedlund shape and type Cassie Hicks as the name. The org chart add-in has rearranged your drawing to position all of your shapes. Notice that Assistant shapes are automatically positioned differently than other subordinate shapes. At this point, you’ve built a reasonably sophisticated organization chart by doing little more that dragging shapes and typing text. CLEAN UP Save your changes to the Org Chart by Hand drawing, and then close it.